#Sharing the Blog Love…Our New Linky! When I started blogging I had no idea there was a blogging community and when I stumbled upon it, I couldn’t believe how amazing it was. It is definitely one of my favourite parts of blogging. I read so many wonderful blogs now and there are always new ones to discover. 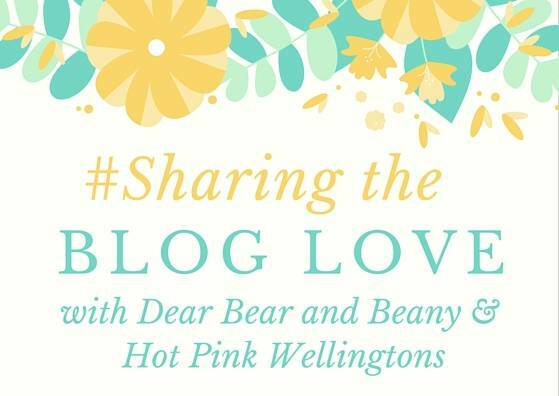 #Sharing the Blog Love is a new linky that I have created with the lovely Katy from Hot Pink Wellingtons. We both love discovering new blogs, and we both wanted to give something back to the blogging community that has been so welcoming. When you press that publish button all you can think about is will anyone read it, is it good enough. It can be hard to get your blog posts seen. Also when you write something brilliant, you don’t always get any recognition for it. Katy and I want to try and help out, to get those great posts seen as much as possible and to say a little well done. The idea is that it will be a weekly showcase of our favourite posts that have linked up. A chance to introduce you to new blogs and sharing the fabulous talent that is out there. Katy and I really want to give as much exposure as possible to the great posts that link up. All you have to do is link up your post, then Katy and I will both read all the posts linked up and leave a comment. We will then each showcase our 4 favourites the following week, as well as tweeting them throughout the week. That means 8 brilliant posts every week will be showcased each week. If you’re chosen as one of our featured posts, we’ll include a link to your blog post and a summary of your post and why we loved it. And if that wasn’t enough exposure, both Katy and I will be linking our showcase posts up to #TheList, a great linky run by Aby at You Baby Me Mummy and Amy at Mr and Mrs T Plus Three. Thank you to these lovely ladies for allowing us to do this. Our linky #SharingtheBlogLove will launch on Thursday 30th June and will then open every Thursday at 7am and close the following Tuesday at midnight. We’ve designed a lovely #SharingtheBlogLove badge which represents a mixture of our two blogs coming together. Please make sure you add the badge to your posts, to be in with a chance to be chosen as a showcase post. If you want to get ready for Thursday, why not grab the badge now ready to add to your post. Katy and I are really excited about this new venture together and we can’t wait to read and share all your wonderful posts. We hope you will join us on Thursday 30th June for our very first #SharingtheBlogLove….eek!! How lovely. The very best of luck with your linky. I don’t take part in linkies, but look forward to reading the posts you showcase. Ooh this sounds like a lovely idea! It’s so nice to see more established bloggers giving newbies a leg up! I am completely new to the “linky” thing but am hoping to give it it a go.